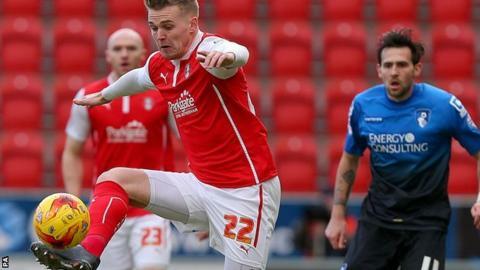 Charlton and Rotherham both scored in the final seven minutes as their Championship encounter ended in a draw. Addicks midfielder Jordan Cousins broke the deadlock on 83 minutes, shooting home from six yards out. The visitors went close to an equaliser with three minutes to go, but goalkeeper Marko Dmitrovic pushed away Paul Green's close-range header. But the Millers did grab a point when Danny Ward converted a high ball into the box in injury time. It was enough to move Steve Evans's side up a place into 20th in the table, while Charlton slip to 18th. Guy Luzon, taking charge of the Addicks for the first time, almost saw his side fall behind when Ben Pringle's shot against the post. Charlton responded and almost took the lead with their first attempt, but Igor Vetokele diverted a Chris Solly corner over the bar. The woodwork intervened again when a Charlton counter-attack finished with Johann Gudmundsson chipping Adam Collin, only for his shot to strike both posts. Andre Bikey's acrobatic effort for the home side then went narrowly over, before the deadlock was broken by Cousins. After Dmitrovic's excellent save from Green, Adam Hammill also went close for the away side before Ward finally equalised in injury time. "Of course we are disappointed. The difference in the side was that we organised well until the last minute. "In the last two games we organised well in defence, with a line-up of 4-4-2, we knew our opponents would play a lot of long balls, and we are ready for the second ball. "After we scored we needed to keep a clean sheet, and we are frustrated." "They say things even themselves out over the season, and we are going to get some penalties if that is the case. "The handball is absolutely blatant, sometimes it is difficult to see from the dugout but there was no guesswork today." Match ends, Charlton Athletic 1, Rotherham United 1. Second Half ends, Charlton Athletic 1, Rotherham United 1. Goal! Charlton Athletic 1, Rotherham United 1. Danny Ward (Rotherham United) right footed shot from the centre of the box to the bottom left corner. Assisted by Adam Hammill with a cross. Attempt missed. Adam Hammill (Rotherham United) right footed shot from the left side of the box is close, but misses to the right. Assisted by Jack Hunt with a cross. Attempt blocked. Adam Hammill (Rotherham United) right footed shot from outside the box is blocked. Substitution, Charlton Athletic. Joseph Gomez replaces Callum Harriott. Attempt missed. Craig Morgan (Rotherham United) header from the left side of the six yard box is too high. Assisted by Kári Arnason following a set piece situation. Attempt missed. Kári Arnason (Rotherham United) header from the centre of the box is close, but misses to the left. Assisted by Richard Smallwood following a set piece situation. Frazer Richardson (Rotherham United) wins a free kick on the right wing. Corner, Rotherham United. Conceded by Marko Dmitrovic. Attempt saved. Paul Green (Rotherham United) header from very close range is saved in the bottom right corner. Assisted by Adam Hammill with a cross. Corner, Rotherham United. Conceded by Chris Solly. Goal! Charlton Athletic 1, Rotherham United 0. Jordan Cousins (Charlton Athletic) right footed shot from the centre of the box to the bottom right corner. Attempt blocked. Johann Berg Gudmundsson (Charlton Athletic) left footed shot from outside the box is blocked. Assisted by Tony Watt. Attempt saved. Danny Ward (Rotherham United) right footed shot from the centre of the box is saved in the centre of the goal. Assisted by Ezekiel Fryers with a cross. Substitution, Charlton Athletic. Christophe Lepoint replaces Milos Veljkovic. Substitution, Rotherham United. Adam Hammill replaces Ben Pringle. Offside, Rotherham United. Danny Ward tries a through ball, but Matt Derbyshire is caught offside. Attempt blocked. Yoni Buyens (Charlton Athletic) left footed shot from the centre of the box is blocked. Attempt blocked. Jack Hunt (Rotherham United) right footed shot from outside the box is blocked. Assisted by Ben Pringle. Attempt missed. Paul Green (Rotherham United) right footed shot from the left side of the box is close, but misses to the right. Assisted by Kári Arnason following a corner. Corner, Rotherham United. Conceded by Rhoys Wiggins. Corner, Rotherham United. Conceded by André Bikey. Attempt blocked. Conor Sammon (Rotherham United) header from the left side of the six yard box is blocked. Assisted by Ben Pringle with a cross. Kári Arnason (Rotherham United) wins a free kick in the attacking half. Foul by Milos Veljkovic (Charlton Athletic). Foul by André Bikey (Charlton Athletic). Matt Derbyshire (Rotherham United) wins a free kick in the attacking half. Ezekiel Fryers (Rotherham United) wins a free kick on the left wing. Substitution, Charlton Athletic. Tony Watt replaces Igor Vetokele. Attempt blocked. Milos Veljkovic (Charlton Athletic) left footed shot from the centre of the box is blocked. Assisted by Jordan Cousins. Corner, Charlton Athletic. Conceded by Craig Morgan. Substitution, Rotherham United. Jack Hunt replaces Conor Newton. Attempt missed. Johann Berg Gudmundsson (Charlton Athletic) left footed shot from outside the box is too high. Assisted by Rhoys Wiggins following a corner. Corner, Charlton Athletic. Conceded by Kári Arnason.